72 new inserts for MC5005, MC5015 grades and assorted chipbreakers. Extra thick Al2O3 coating layer for increased tool life. Nano-Texture coating technology gives outstanding wear and chipping resistance. TOUGH-Grip Technology for superior adhesion between coating layers. Applications where ceramics were applied at accelerated surface speeds. 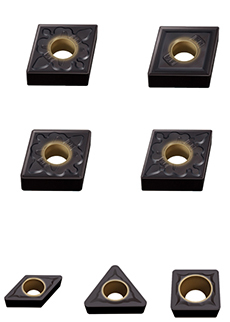 All cast Iron and ISO-K applications. Applications where toughness and wear resistance are needed. Continuous and interrupted cast iron applications. New ISO-K grade of MC5005 for more wear resistant applications. New ISO-K grade of MC5015 for severe and interrupted applications.